Our ‘U Rock’ project is continuing to grow. The first year classes have painted their stones and they are starting to add them to the outdoor art piece. Thank you to their CSPE teachers for accommodating this and the group of TY students who ran the workshops in the art room. 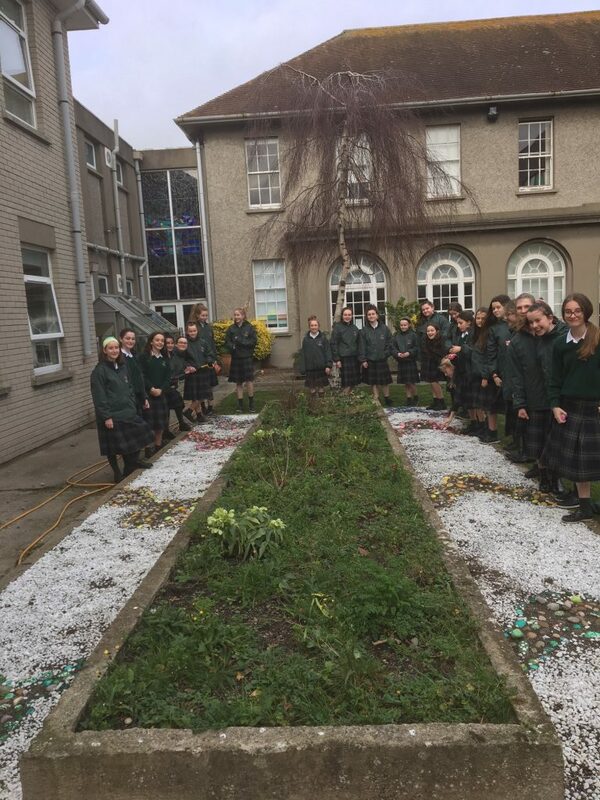 During CSPE class, on Tuesday the 15th of January 2019, 1P participated in the URock project that has been running in the school over the last few months as part of the new focus on Wellbeing. The Urock project consists of a class choosing a colour and then painting rocks in that colour. Afterwards, once the paint is dry, the class place their rocks in the collective school mural during a small ceremony. The mural is in the lovely flower bed in the quadrangle. Our class chose pink. We all went to the art room and had a great time painting our stones. Two weeks later, we collected our dried, varnished rocks and headed out to the quadrangle where some classes had already placed their rocks in a wave like design. Aobh read a beautiful poem about friendship and we placed our stones down and knocked them into the ground with a mallet. After that we all went back to the classroom and talked about how we would describe 1P. Some of the words we came up with were family, funny and supportive. We also talked about what defined us as 1P and what we like about our class.